Highly configurable GPL-licensed FTP server software. ProFTPD grew out of the desire to have a secure and configurable FTP server, and out of a significant admiration of the Apache web server. 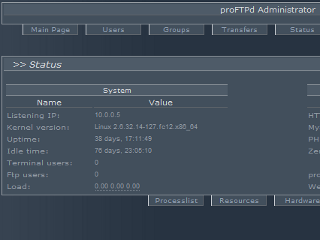 When the Project began, the most commonly used server was wu-ftpd. While wu-ftpd provides excellent performance and is generally a good product, it lacks numerous features found in newer Win32 FTP servers and has a poor security history. Many people, including the developers who work on ProFTPD, had spent a great deal of time fixing bugs and hacking features into wu-ftpd. Unfortunately, it quickly became clear that a complete redesign was necessary in order to implement the configurability and features desired. In addition to wu-ftpd, there are a few of other FTP servers available which are designed to be light-weight and secure at the expense of configurability. For example, Troll FTP is an excellent FTP daemon which is considerably more secure and less resource-intensive than wu-ftpd. Unfortunately, while it is quite suitable for basic FTP services, it does not offer the feature set required for more sophisticated FTP sites. ProFTPD is not a hack based on any other server, it's an independent source tree from the ground up. A number of well known and high traffic sites use ProFTPD. This app is in status ALPHA and is only available for testing to members of the Amahi Tester Program until the app is stable to become Live.